The La Waterfront Hotel (Dameisha haijing jiudian) is situated on beautiful Dameisha Beach, about 70km from the airport and 30km from the railway station. The hotel consists of three spacious five-story buildings. There are more than 300 elegant rooms and suites in different styles. All rooms are fully equipped with satellite TVs, minibars, safes and international direct dial phones.. There are several restaurants in the hotel, such as the Pattaya, the Mediterranean Buffet, the Little Pigeon Seafood Restaurant, the South Noshery, the Hawaii Luau, the Barbecue Bar, the Noble Western Restaurant and the Lobby Bar. The hotel's Grand Ballroom can hold up to 250 people. 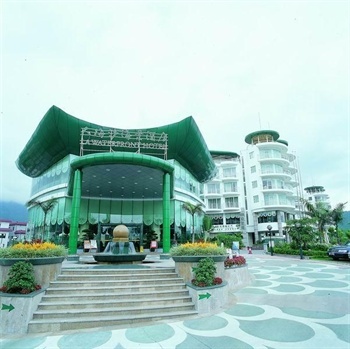 For recreation, there is an indoor swimming pool, massage, sauna, billiard room, chess/card room and a karaoke.